And in just those first five panels of cute artwork, establishment of a lovable main character, and one hilarious sarcastic punch line, I knew this was going to be one great comic. I was hooked on Nina. Nearly a year later, the comic is still going strong with a weekly release schedule on the news site. Nina has reached such a high popularity that the New York Anime Festival offered Sevakis a chance to come to the convention as a “Featured Guest” this year. Quite an impressive achievement for a first-time comic artist. So being the unashamed Nina fanboy that I am, I asked to sit down with Sevakis during the convention to learn more about Nina and the clever artist behind it. Robin is the younger sister of Justin Sevakis, the founder of the Anime News Network. The siblings got started watching anime 15 years ago, back when Robin was only in elementary school. A friend of Robin’s introduced her to shows like Project A-Ko and Dominion Tank Police. Robin, in turn, introduced the shows to her brother, and the two have been fans since then. Her brother noticed that Robin’s obscure comics were funny, and he suggested that she pursue drawing comics a little further. He recommended starting a comic about anime and then try to get it onto ANN. So she began sketching out Anime News Nina and put together a few concept strips. After the staff of ANN reviewed the strips, they approved and Nina began its weekly run. The character of Nina was inspired by Jadress, a blond elf character sketched out by Sevakis that served as her personal mascot in most of her early works. After the Anime News Network website took off, the teenage Robin pestered her older brother to include her artwork on his site. He eventually gave in and added Jadress to the header of the each page. The illustration became somewhat of an mascot for ANN at that point. When ANN went through a redesign, they did away with the Jadress image and many readers (including myself) wondered whatever happened to the elfin mascot. 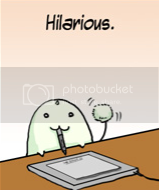 So Robin decided to create a new mascot for her comic that was a little more applicable to anime fandom and less about fantasy. And so began Nina, the new ANN elf. 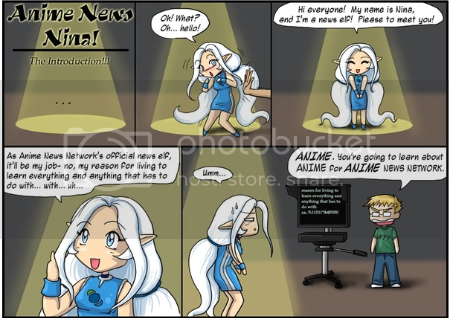 Sevakis created Anime News Nina as a satirical look at anime fandom in general. “I thought it would be funny to have a comic about a person new to fandom just seeing it for the first time.” She wanted to recapture that wonderment that we all felt going into the subculture. Although a lot of her strips take place at an anime convention, Robin says that she very rarely attends them, having to stay within the affordable reaches of her home state of Michigan. Most of the weird convention stories she writes about come second hand from either her brother or other staff members of ANN who are constantly on the road covering them. But she also draws a lot of humor from the online community by watching flame wars and stupid arguments take place in online forums. In one of my personal favorites, two world leaders find common ground when they discover that they were both otaku. But after a bit of of a disagreement over Naruto, their argument escalates to the point of a nuclear war. Yet surprisingly, she is not a big fan of webcomics herself, saying that she only reads a few strips like Penny Arcade and The Perry Bible Fellowship. But she calls herself a fan of very offbeat humor, citing inspiration from stand-up routines, dark comedies, and Seinfeld. Well, apparently she’s figured out it, because her sense of humor really goes over well with her audience. I’ve been a huge fan of the strip since the beginning, and I know I’m not the only one. In fact, mostly everyone I had spoke to at the convention about the comic had seem to be very familiar with it and had nothing but good things to say. 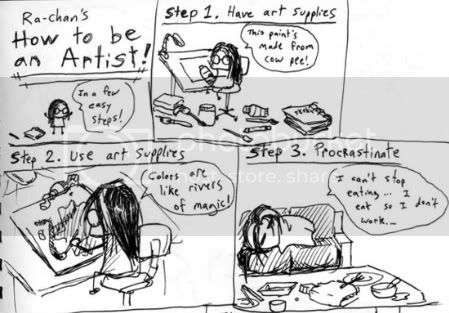 While her art is still very cute and appealing, I would have to agree the heart of the strip is in the content. Robin comes up some of the funniest jokes geared towards the an otaku audience, and they completely understand it and eat it up. 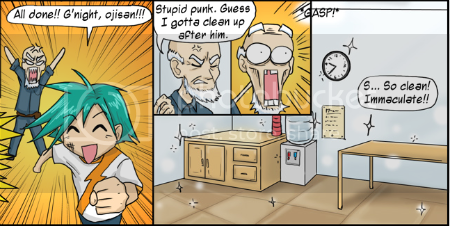 One of the most popular jokes in Nina is Ultimate Mop Daisuke DX, a parody of a tournament fighting anime involving a novice janitor aspiring to be the best. But even Sevakis was surprised at how well the parody was received by readers, and jokes that Ultimate Mop Daisuke DX might be more popular than Nina itself. She recalls how someone once made a Daisuke Wikipedia entry, but it was later deleted due to the fact that it was not a real show. Another fan even created a Daisuke theme song in a podcast episode. But there are some times that I wonder if Sevakis crosses a line with her parodies of anime fans. 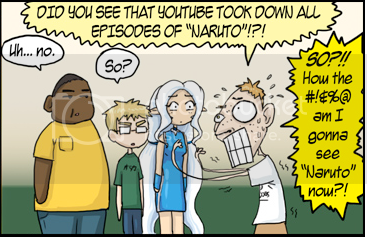 In one strip, she portrays a “Narutard” as an idiotic man complaining about Youtube removing anime episodes. A lot of fans I’ve talked to seem to remember this strip in particular, and I believe this is because they secretly sympathized with the Narutard’s anger over C&D takedowns. So has Robin ever gotten heat over this strip? Unaware of who she was talking to, I bashfully admitted to her that I was the one that wrote that, and we end up talking about fansubs for a bit. But I think that if I end up being one of her biggest critics, then she probably has not made too many enemies with her lampooning. She tries to keep it that way. So Sevakis has built up quite a fanbase with her comic, but how long will she be able to continue with it? Recently, she had taken up a full time job illustrating for a video game company in Seattle. Her free time has been very limited, and sometimes she struggles to meet a 9:00 deadline every Tuesday night. What about content? We are such a niche subculture that it would appear that she has pinned down every oddity we know about. Is she ever worried about running out of material? “I’d say that I worry about running out of jokes about every week, but somehow something always comes out. I mean, the stuff I see at this convention alone is enough for several comics,” she laughs. And as long as she keeps making more comics, we’ll keep reading them. If you have yet to check out Anime News Nina, I cannot recommend it enough. A new strip is released every Tuesday night around midnight on the east coast, and she has a great track record of delivering some pretty funny jokes. This entry was posted on Wednesday, October 8th, 2008 at 6:38 pm by Scott	.